Hola! Feed Me Tapas, Por Favor! Tapas and Tempranillo – two of the best ways to enjoy the flavours of Spain. Tapas restaurants around the country are popular destinations for Friday after work drinks, when small bites work perfectly well with a glass of wine and friends gather to celebrate the end of another busy week. Originating in Spain, where according to legend, King Alfonso the 10th fell seriously ill and was only allowed to consume small portions of food with small amounts of wine, tapas can literally be any type of fare from fruit and nuts to roasted meat and stews. After recovering from his illness, the King declared no wine should be served at inns without food and so the tradition began. Other historians believe tapas started with farmers in the fields, who ate small meals accompanied by wine throughout the work day, to provide much needed energy between meals. Sip sangria alfresco under the pergola at Despana on Glebe Point Road in Glebe. Celebrating Spanish culture, this restaurant draws a lively crowd with wooden oak barrels and bright red geraniums adding a cheery vibe enticing diners to relax by the fireplace in a cushioned annexe, before dining amid log and mirrored walls from an ever-evolving menu. Kick start a taste adventure with spiced cauliflower fritters, hot smoked paprika, Maldon salt and parsley; then delve into chorizo and Manchego croquettes with citrus aioli and Russian salad on a crostini, with rare seared tuna. 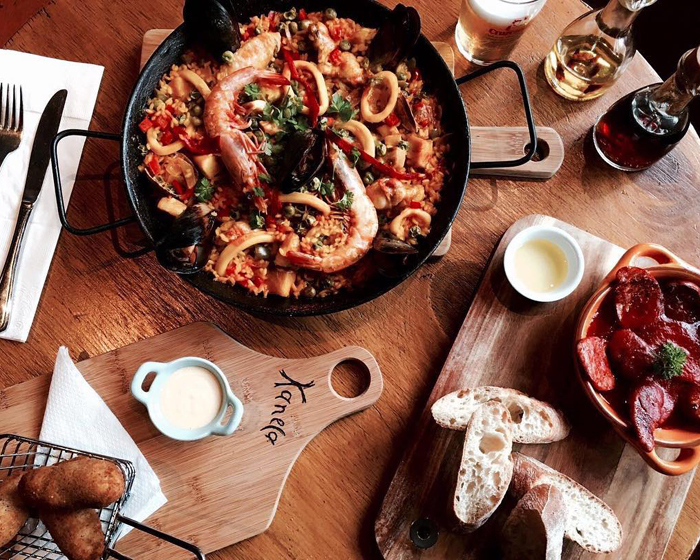 Those with hearty appetites may opt to share traditional prawn, mussel and clam paella; finishing with warm chocolate churros…delicioso! Say hola to tasty delights at Alegrias Spanish Tapas restaurant on Darling Street in Balmain. Plush décor, hardwood flooring and dangling chandeliers span this split-level establishment, creating the ideal setting for smart casual dining, while flamenco dancers and Spanish guitarists provide lively entertainment. With a focus on using fresh, local produce, Alegrias’ menu features shared tapas plates including slow braised pulled beef empanada pastries, served with mojo picon. 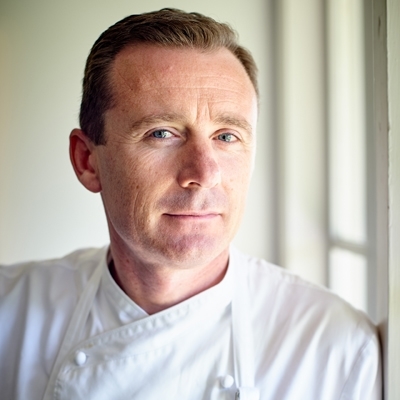 For the main affair, crispy and tender pork belly with caramelised apple and honey sautéed carrots may hit the spot; or black squid ink seafood paella with fresh calamari, red capsicum and lemon, making sure to leave room for a dessert of traditional Spanish crème caramel and a scoop of gelato. The Black Footed Pig Tapas Bar & Kitchen. Hobart locals hoof it to The Black Footed Pig Tapas Bar & Kitchen on Brooke Street for tapas to share in suave, sleek surrounds. Nestled on the lower level of heritage listed City Flour Mills in the bustling Salamanca waterfront precinct, this Spanish venue combines old and modern with exposed brick walls, glass pendent globes and a mosaic tiled floor, creating a fun and funky vibe to mingle with friends over a drink of choice. 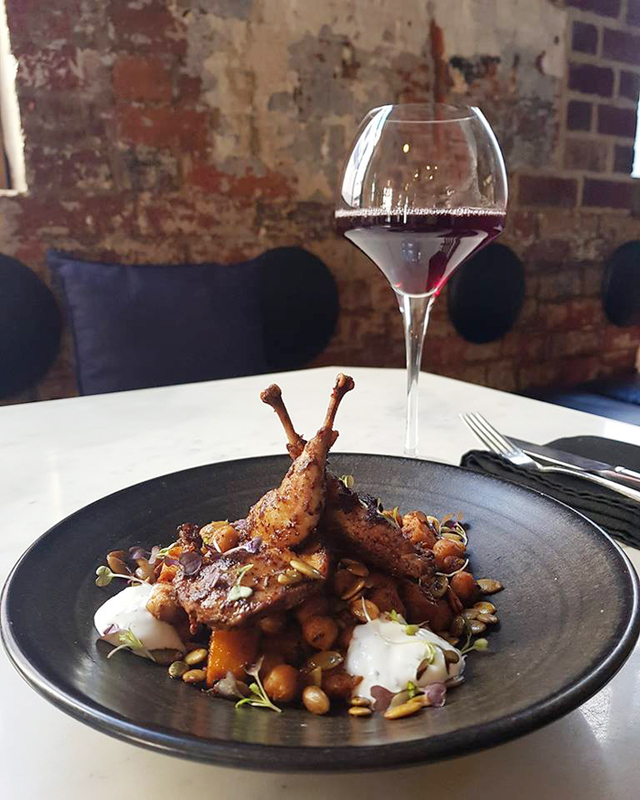 An ever-evolving menu utilising fresh local and ethically sourced produce, plates up mouth-watering morsels like quail, chickpeas, roast pumpkin, coriander and yoghurt; or grilled Tasmanian calamari, mojo verde, puffed black rice and hazelnuts. Larger appetites may choose beef short rib, roast garlic, celeriac, baby turnips and sweet potato shards; while dessert lovers won’t go past spiced honey parfait, walnut caramel and honeycomb, teamed with a glass of Malaga Telmo Rodriguez MR Moscatel. Kanela Flamenco Tapas Bar and Restaurant. Experience unbridled Spanish vibrancy at Kanela Flamenco Tapas Bar and Restaurant on Johnston Street in Fitzroy. Melburnians travel far and wide to enjoy exotic tastes, famed flamenco artists Richard and Johnny Tedesco and fiery dancers, who mesmerise under bright lights as diners ponder a dazzling array of fare. As maracas clack and heels spin, begin an intoxicating adventure with a glass of Kanela’s secret sangria recipe and authentic tapas such as char-grilled Mediterranean sardines, braised prime beef meatballs in tomato salsa and traditional garlic prawns with a hint of chilli, served sizzling in a clay pot. Pick up a char-grilled Spring lamb skewer, marinated in Spanish spices, or a plate of steamed mussels and pipis, in onion, garlic, tomato and white wine sauce; then satisfy sweet cravings with churros with chocolate sauce, or housemade cream caramel with a hint of Cointreau. 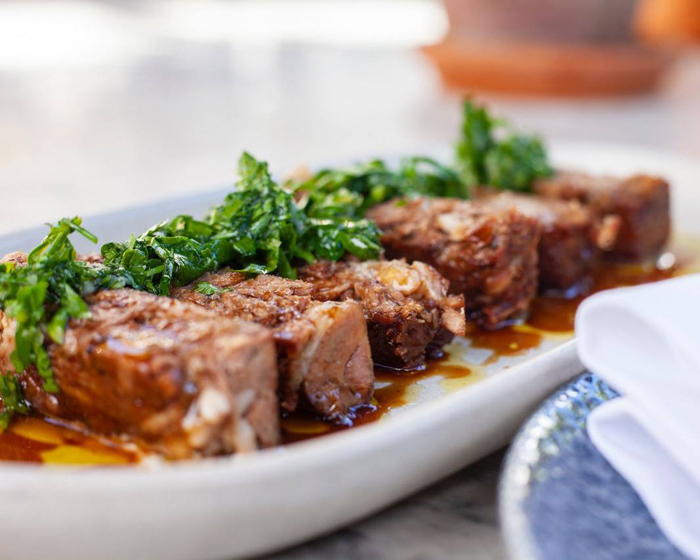 With a glass of red in hand, work your way through a menu of Catalan flavours at Las Tapas on Chapel Street in St Kilda. This lively eatery offers guests a slice of Espana along with flamenco guitar performances, in rustic surroundings of brick, timber and polished concrete floors creating an ideal vibe for after work drinks and share plates. From a daily market menu, expect taste tempters such as a hearty plate of beef spare ribs with chimichurri sauce; or snack on salted Spanish anchovies served with Catalan bread. Don’t forget to try special offerings like tender grilled quail, drizzled with tangy pomegranate vinaigrette, scallops with Romesco sauce and saffron infused seafood soup. Drop by on Sundays for a paella lunch of seafood and chicken, or organise your own paella party at home with catering supplied by Las Tapas. Backlane Tapas & Wine Bar. 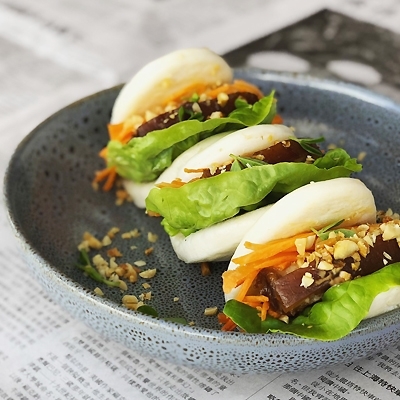 As long as the lights are on, Backlane Tapas & Wine Bar on First Avenue in Mooloolaba will be serving delicious fare and drinks of choice to locals and visitors alike. Just one street away from Mooloolaba Beach, swing by Backlane and settle in for the evening in bench-style seating indoors, or alfresco street tables and select from an eclectic Mediterranean fusion menu, including starters such as polenta chips with Manchego custard. Seafood lovers can share platters like white anchovies, pickled vegetables and toasted bread; or Cuca sardines, organic olive oil, almonds and greens; while crème Catalan ice cream, pear, almond and spiced pastry entices for dessert, alongside churros, chocolate and vanilla ice cream. An industrial, upcycled and vintage vibe awaits diners at Fusion Art Bar & Tapas on Spence Street in Cairns. Fusion was born from an artist’s love of sharing their passion with guests, in a relaxed ambiance of exposed red brick walls and high concrete ceilings. Utilising old furniture and timber combined with handmade cutlery and ceramic ware, this tapas bar fuses modern and old world in effortless style, whether stopping by or an all-day brunch or sharing a drink and plate with friends later in the evening. Enjoy Spanish style braised squid, tomato and lime sauce, or marinated sardines on bread with sour cream and tomato; before larger plates of sticky pork ribs, mash potato and Whiskey barbeque sauce. For an authentic touch, try the chicken, seafood and chorizo paella; then sweeten the finish with macadamia baklava, Turkish coffee ice cream and honey sesame syrup. Rustico Tapas & Wine Bar. Bursting with bold colours and a bright verandah offering balmy sea breezes, Rustico Tapas & Wine Bar on Rockingham Beach Road in Rockingham is well suited to group gatherings. Set along the vibrant beach foreshore, this venue provides a variety of seating options and laidback vibe ideal for Spanish style share fare, such as La Boqueria chorizo, roasted red pepper, Brandy and herbs. 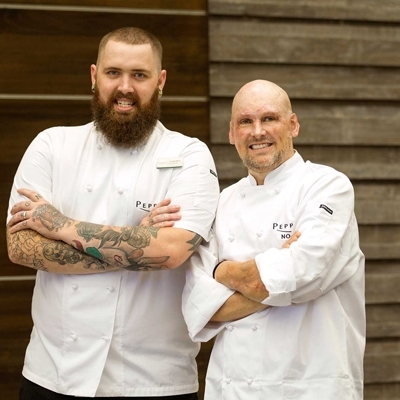 Delve into the likes of pork belly with pig fat potato puree and Pedro Ximinez jus, with a side of charred corn, butter and Manchego cheese; or raw Geraldton Kingfish, lime, avocado, coriander and chilli. Those dining in groups of four may opt for a paella mixta of Spanish bomba rice and saffron, brimming with mussels, prawns, fish, squid, chorizo and Mount Barker chicken; perhaps opt for Rustico’s six-course degustation with matching wines from around the world, or enjoy your meal with a jug of raspberry and ginger Rose Sangria. Kalgoorlie locals in the mood for tapas, head to Cecilia’s On Hay. This all-encompassing entertainment venue offers fine fare and accommodation in infamous surrounds on Hay Street, where it was once an upmarket brothel. Now Cecilia’s welcomes guests into vintage opulence with softly draped French doors and windows, mosaic covered dining chairs and mood lighting creating a relaxed, yet glam ambiance. 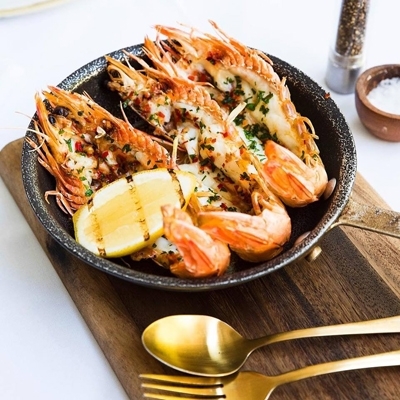 Settle in with a cheeky cocktail and graze on plates like potato with chopped fried chorizo, tomato, onion, garlic and herbs - or oven baked chicken tenderloins, coated in yoghurt and polenta; while seafood lovers may be hooked by garlic butter prawns with avocado mousse. Sweet tooths can indulge with a dessert of berry and pear crumble with vanilla cashew cream, while sipping one of two house blends of red and white sangria. 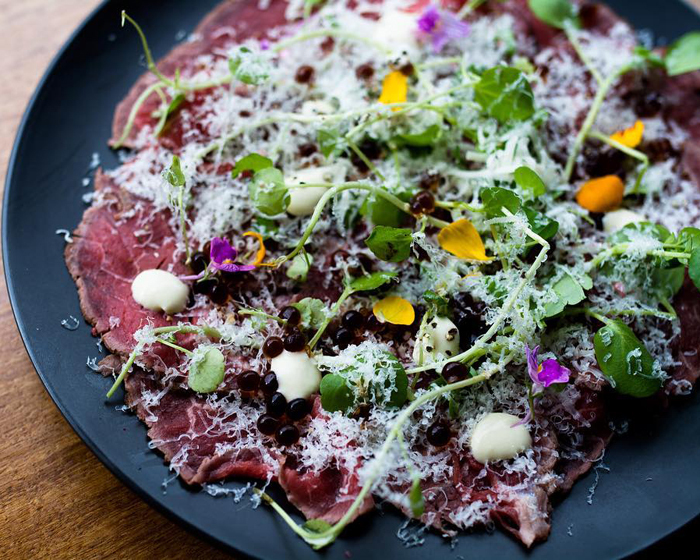 With an ethos of good times and great food, Tipsy Bull on Lonsdale Street is the place to satisfy tapas cravings in Braddon. 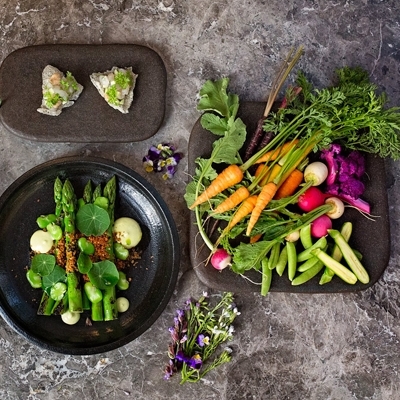 With a sophisticated, yet relaxed atmosphere created by stylish finishes from a sleek marble topped bar and slatted wood walls, to a spacious courtyard garden filled with greenery, guests enjoy a creative menu brought to life with seasonal, fresh local produce. 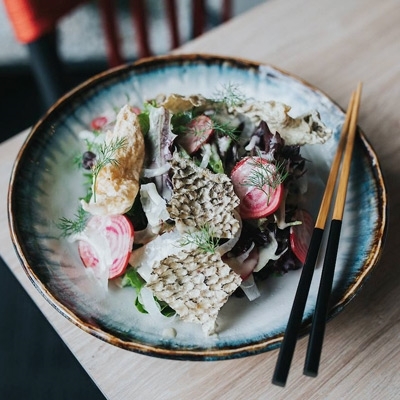 Delve into small plates like crispy spiced squid with lemon and garlic aioli, or betel bites topped with caramelised pork belly, cashew nuts, chilli and lime; while red snapper with coconut lime crumb, barbequed bok choy and mild coconut chilli dressing may entice as a main affair. Can’t decide? Put yourself in the Chef’s hands and opt for an eight-course tasting menu, best teamed with a signature cocktail like Senorita Highball, with Bacardi Fuego rum, orange and ginger kombucha and pineapple syrup; or Tipsy’s espresso martini, with caramel vodka, mocha liqueur and Lonsdale Street Roasters espresso. Bringing Mediterranean inspired tapas to Kangaroo Island, Table 88 on Deep Gully Track serves up a rural setting with glimpses of Stoke Bay in the distance. A relaxed ambiance and welcoming vibe entice guests to linger on the deck at wooden barrel tables with a glass of wine in hand and choose from a share plate menu highlighting local KI produce, tempting tastebuds with mouth-watering morsels of grilled marron with garlic butter. Tuck into a bucket of KI yabbies and herb mayo, or perhaps pork and veal meatballs in a rich tomato sauce, with a side crispy patatas bravas, smoky paprika dressing and mayo; don’t forget to try the Portuguese custard tart as a sweet finish to a memorable meal. 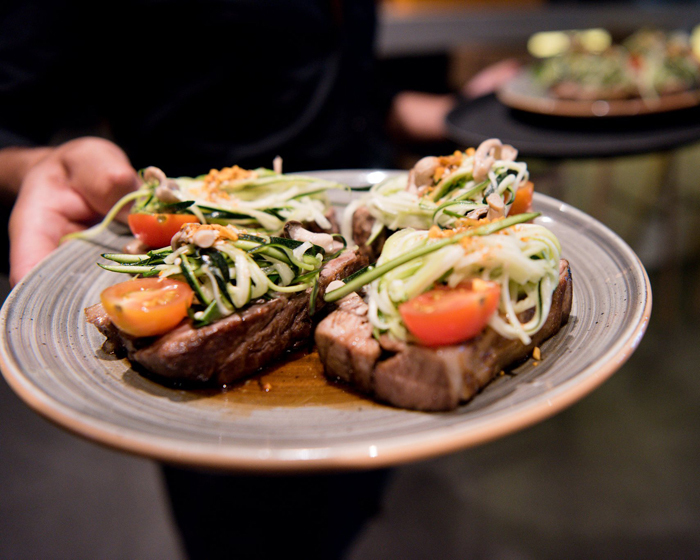 Welcome the weekend with after work drinks and fare at Nook Nosh on Unley Road. A relaxed rustic feel, with the warmth of worn brick walls, black painted ceilings and local artwork adding colour and texture, wine down with a glass of red and grazing plate of gourmet SA produce. 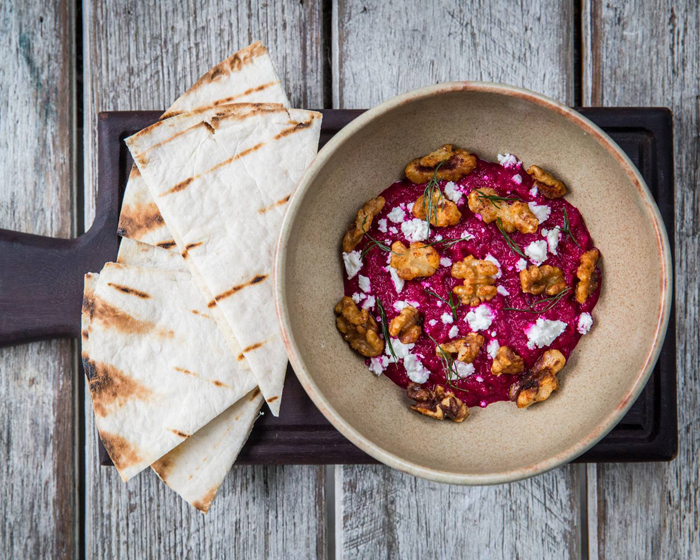 Sundays see live music sessions as guests share plates such as aged chorizo, pan tossed with caramelised onion jam and served with toasted light rye sourdough; or mushroom, pumpkin and three cheese arancini balls. Pizza lovers can pick up a slice of Magic Mushroom, with Swiss brown mushrooms, mascarpone, pecorino, garlic, lemon and thyme, or Gorgeous George – topped with Greek lamb, red onion, cherry tomatoes, cheese and tzatziki. 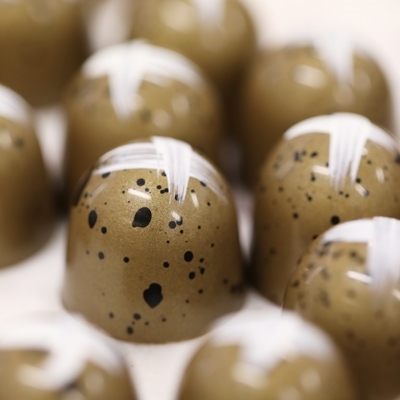 There’s even a milkless board selection of artisan crafted dairy and soy free, vegan-friendly cheese alternatives, such as smoked hickory, salted spinach and artichoke. Are you in the mood for terrific tapas but can't see anything near you? Click here for Tapas and Spanish restaurant recommendations.